Maserati's Illustrious Racing History Doesn't Mean Diddly-Squat To The Crusher! We know, the Biturbo really was a black eye on Maserati's reputation… but it's still strange seeing Italian royalty surrounded by proletarian-grade Volvo 240s and VW Golfs in my local self-service junkyard. While the engine appears to be complete, the interior seems beyond redemption. It goes without saying that the first guy to find this car on the yard went ahead and pried off all the Maserati emblems, with the exception of the sill plates. 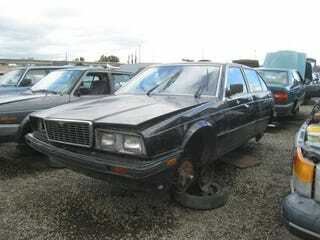 Anyway, this is my very first junkyard Maserati, after a quarter-century of junkyardic experience. Thanks to Citroën god Henry Hanzel for pointing me in the direction of this great Junkyard Find!